The multiverse of multi-screens can be achieved with just one thing: A HDMI splitter! These hubs allow you to share a signal between multiple displays. It works for computer monitors, televisions, sales display, or multiple screens for meetings. The Best HDMI splitter will also have features that provide better bandwidth, color support, USB 3.0 support, and output options that will make your display even better. This review provides an overview of what to look for in the best HDMI splitter as well as a few of our top picks. These devices allow video and audio to be sent through multiple screens at the same time. With a high-quality HDMI splitter, you get 1080P HD video resolution and high definition digital audio. Newer devices also support 3D video. HDMI splitters typically look like a small cable box or a wire with multiple HDMI cables attached. They come in 2, 4, 8, and 16 port configurations as well, depending on the amount of displays that you want to hook up at the same time. You can set up HDMI splitters at home, offices, art galleries, conferences, and so forth. There are also various types of splitters, including UTP HDMI splitters. These also work over Cat5e and Cat6 cables. HDMI splitters are different than switches but some splitters have the same functionality. You can switch between multiple devices through HDMI to a single HDMI TV or LCD. There are some things that you can do with some splitters that you can’t with others. There are also very old models out there that claim to support HD resolution but may not support ULTRA 4K or 4k x 2k displays as best as others. These are some of the features that should be included, and you also don’t want to pay too much. With the way that displays are nowadays, you never know when you are going to need to support 480i up to 4K high definition screens. You should make sure that the display can handle the latest resolution so you are always ahead. If you are doing a lot of installations and displays that require 3D graphics, then you want to make sure you can support it fluidly with brilliant colors that show off the dimension. In some cases, you’ll find splitters that can display more than one screen with different data inputs and switch between them. These are a little bit more high-tech and have an additional cost, but it’s worth it if you want to be able to have more control over what displays on each screen. Many devices should be able to attach to the HDMI splitter, including support for Xbox, PS3, PS4, HD TVs, and so much for. In this case, you want the best HDMI splitter to support data transfers with a high MHz or GHz rating. The HDMI splitter should also be HDCP compliant. If a splitter doesn’t come with a warranty, then you shouldn’t pay very much for it because you could be causing yourself a headache if it stops working or doesn’t work with your displays after awhile. It’s always best to read through customer reviews to see if the HDMI splitter has had any issues. The best HDMI splitter should work best with your display setup and not cost you that much. If you want options that include switches and remote controls, then you may pay a bit more for that functionality. Finding the best HDMI splitter that suits your needs is most important. Whether you are looking for a cheaper price, more ports, or want a 3D HDMI solution, these splitters provide a variety of options. You should also look at cables and prepare to purchase extension cables if you do need multiple displays. 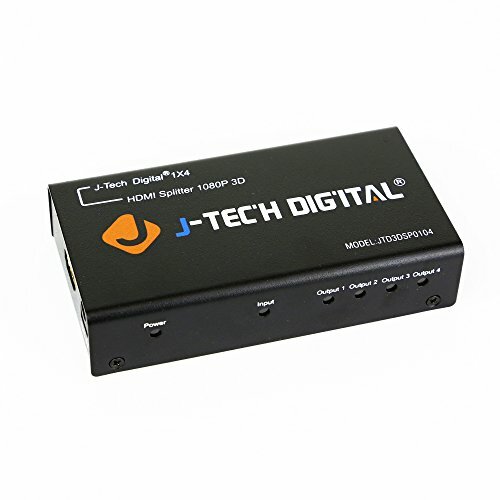 J-Tech Digital has developed an HDMI splitter with a number of options. You can purchase based on ports or what type of HD you are looking for. You can choose between Ultra HD, mini, regular HD, audio extractor, and multiple port solutions including up to 16 ports. One of the best parts of this HDMI splitter is the 1.3 certified for HD 1080P. You know that this TV will give you brilliant color and HD audio. This splitter also supports up to 10.2 Gbps. With this splitter, it’s easy to hook up multiple displays, play blue-ray discs, support surround sound, and get HDCP 1.2 protocol compliance. This is a simple solution for those who want to display to multiple screens with just a cable. You don’t need a box with this splitter. While it only includes two outputs, it’s perfect for those who have a basic setup. 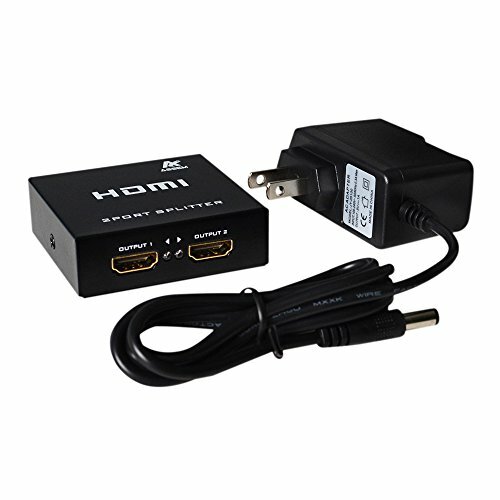 Also called a mini HDMI splitter, it can distribute one signal into two HDMI outputs. It also transmits video and audio at the same time with absolutely no lag. It’s also very portable. 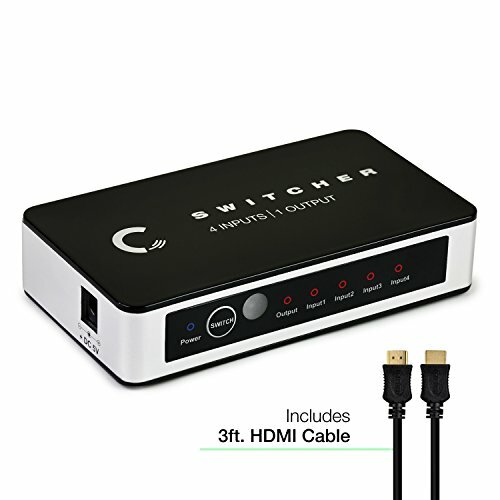 Despite being a basic cable splitter, it supports Ultra HD 4k resolution, 3D video, and HDCP compliant. It also includes a USB cable. 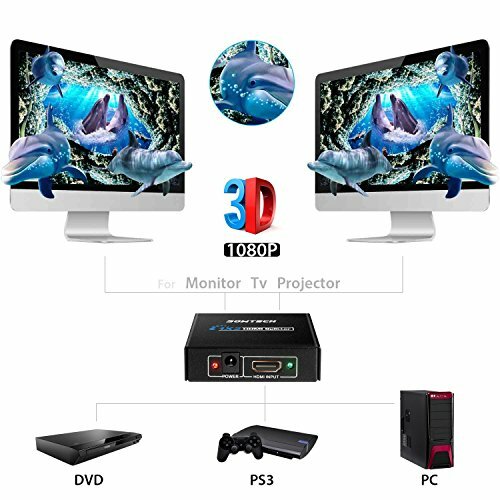 Want something that does the job and provides excellent resolution with 3D compatibility? That would be the ASSEM Ultra HD 4k x 2k HDMI splitter. It has 1 input and 2 outputs, allowing you to immediately display video and transmit audio with no loss or lag. 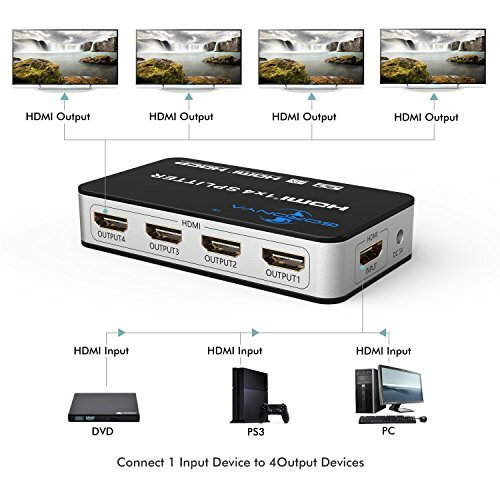 Whether you want to create an office presentation that everyone can see or you need to broadcast simultaneously at home, this HDMI splitter is high performance and easy-to-use. 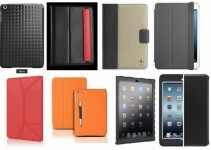 The company also provides a full refund or replacement if there are any issues. The Expert Connect is a newer, sleeker version of the bulky HDMI splitter box. It’s also cheaper than some of the other options on the market as well. 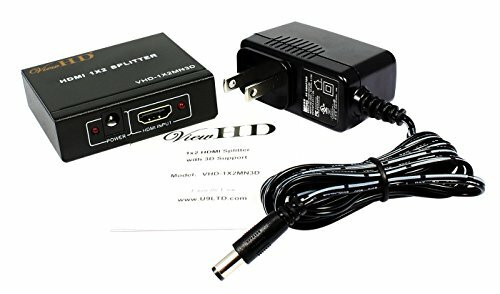 This splitter supports Ultra UD, four ports, full HD/3D support, PS4, XboxOne, Blu-Ray, and DTS Digital or Dolby Digital sound. There are actually two versions of this splitter. If you only need two ports, there is a smaller model that can support just the displays you need. In addition to HDMI ports, it has a DV 5V input for the power adapter. You can get this splitter with a two-year warranty and lifetime tech support through Expert Connect. Techole has created a great solution to the problem with splitters. How do you switch between displays or input different screen data? Techole created a bi-directional manual switch that has 1 in 2 out or 2 input output. It also doesn’t need an external power. This makes it incredible portable and perfect for any displays that you need to set up. It supports 3D HD 1080P, Xbox, PS4, Roku, Blu-Ray, and 4K x 2K resolution, as well as HD audio. It is also made from durable aluminum alloy. 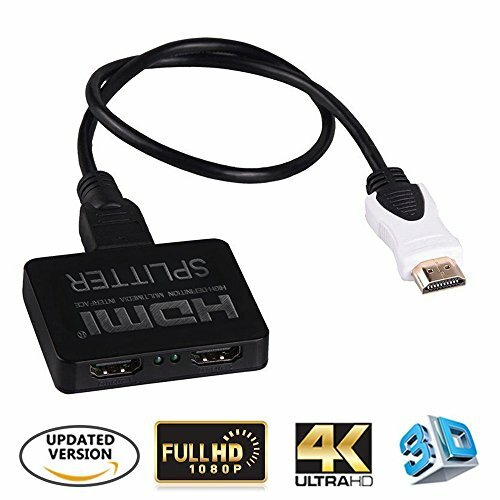 This is one of the only switches and splitters on the market that is below $20, so it’s a great value and should be in your used if you need to broadcast and switch between multiple screens. This is a simple HDMI splitter for two displays that supports all resolutions up to 3D. 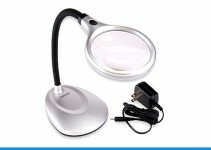 It has a durable metal casing and includes a universal power adapter. You also get a EDID duration of four seconds. However, this model does not support CEC or Ultra 4K resolution. 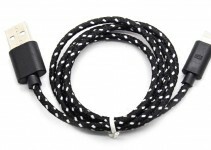 The max cable extension is 10 meters for HDMI cable and 15 meters for 26AWG HDMI cable. You also get a one-year warranty. ViewHD has more high-tech options that cost a little bit more and include multiple ports as well as remote control switch support and Ultra 4K HD compatibility. Looking for a hub that supports two putputs and dual female splitters? The SOWTECH is a great, low-cost option that has a strong chip and can process up to 225MHz of data. It also has a signal bumper and is compliant with HDCP 1.0/1.1/1.2/1.3. SOWTECH also promises zero signal loss and supports up to 15m long distane signal transfer. It also support up to 1080P HD and 3D data transfer, while also being compatible with V1.2, V1.1, and V1.0. It is also made from tough metal and can support all Xbox, PS4, PC, and other displays. Included with this package is a 1x5V Power adapter and 12-month warranty. You can split one HDMI signal eight different ways with this HDMI box. The design is rather sleek and flat, so it can easily be hidden between a display. 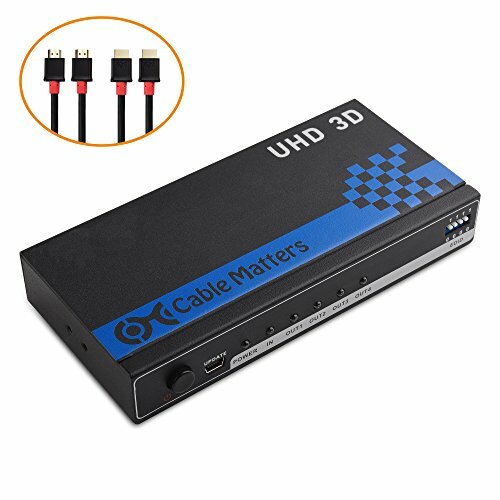 This splitter supports Ultra 4K HD as well as 3D and goes up to 30Hz for data transfers. For audio, you can also get support for LPCM, Dolby-AC3, DTS7.1, DSD/Dolby/DTS-HD and more. OREI also states that it can support any resolution and is also HDCP 1.2 Protocol Compliant with a 1.4V HDMI output. It includes the splitter, adapter, and manual. Unfortunately, it does not seem to be covered by warranty. The cost is also a bit more with this unit, so expect to pay over $50. This is a rather highly-rated four-port HDMI splitter that can be used to display Ultra HD 4K displays across four different screens. It also includes a twin pack of HDMI cables. However, the cables are a little bit short, only 6 ft.
You can distribute video simultaneously across all screens, connecting them through gaming consoles, Blu-Ray players, satellite set ups, and much more. It also allows you to get 3D and surround sound instantly. 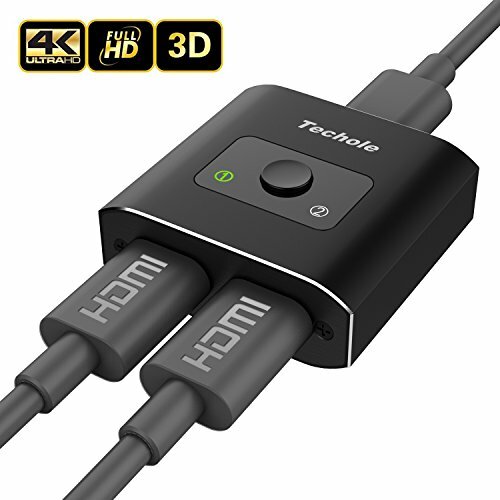 The 4-in-1 output is powered by a gold-plated HDMI connectors and EMI/RFI proof metal housing keeps the splitter safe. It’s very lightweight and portable, which makes it perfect for those who travel and need a compatible, easy-to-use splitter. One of the best HDMI splitters out there is this highly-rated Goronya four-port HDMI splitter that supports up to 4K x 2K Ultra HD resolution and 3D. You don’t suffer any loss in quality with this display output, and it’s compatible with all resolutions as well as Dolby TrueHD and DTS-HD. You can also use this with blu-ray DVD, HDTV, Xbox, PS3, PS4, Fire TV Stock, Roku, Apple TV, and a variety of other devices. This is the perfect splitter to set up for your office or at home. It comes with an 18-month limited warranty and 24/7 support through Goronya as well. Conclusion: Which HDMI Splitter is Best For You? One of the things to consider in selecting the best HDMI splitter for you, is the price for the value and what you need. If you know that you only have two displays or have a specific setup that requires a very basic output, then you can go with a cheaper option. In that case, you may want to go with the SOWTECH. However, if you just want a simple splitter that can support multiple displays, why not go with Goronya? It comes with a warranty and supports a variety of resolutions up to Ultra 4K HD.